John Piper's Let the Nations Be Glad!, now in its third edition, offers a biblical defense of God's supremacy in all things and provides readers with a sound theological foundation for missions. This companion DVD offers a series of six thirty-minute sermons by Piper on the topics found in his successful text. Topics include defining missions and defining peoples, the urgency of missions, the goal and the fuel of missions, prayer, and suffering. The DVD makes the book's content available to a wider audience through its dynamic presentations. About "Let the Nations Be Glad! 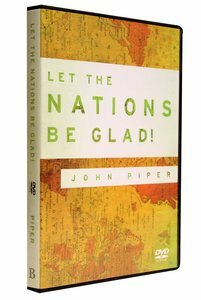 (Dvd)"
:John Piper's Let the Nations Be Glad!, now in its third edition, has sold over 185,000 copies. It offers a biblical defense of God's supremacy in all things, providing readers with a sound theological foundation for missions. Now this companion DVD offers a series of six thirty-minute sermons by Piper preaching on the topics found in his bestselling book. Topics include defining missions and defining peoples, the urgency of missions, the goal and the fuel of missions, prayer, and suffering. The DVD makes the book's content available to a wider audience through its dynamic presentations. John Stephen Piper was born 11 January 1946 in Chattanooga, Tennessee, to Bill and Ruth Piper. The Pipers soon moved to Greenville, South Carolina, where John spent his growing-up years. His father was an itinerant evangelist who also ministered through international radio and Bible courses. John has written a tribute to his mother, who died in 1974, in the booklet, What's the Difference (Crossway Books, 1990) which is also chapter one of the book, Recovering Biblical Manhood and Womanhood (Crossway Books, 1991). At Wheaton College (1964-68), John majored in Literature and minored in Philosophy. Studying Romantic Literature with Clyde Kilby stimulated the poetic side of his nature and today he regularly writes poems to celebrate special family occasions and rich, biblical truths. At Wheaton John also met Noel Henry whom he married in 1968. Following college, John completed a Bachelor of Divinity degree at Fuller Theological Seminary in Pasadena, California (1968-71). While at Fuller, John discovered the writings of Jonathan Edwards. John did his doctoral work in New Testament Studies at the University of Munich, Munich, West Germany (1971-74). His dissertation, Love Your Enemies, was published by Cambridge University Press and Baker Book House (and is now available through Crossway). Upon completion of his doctorate, he went on to teach Biblical Studies at Bethel College in St. Paul, Minnesota for six years (1974-80). "The ministry of preaching is the central labor of my life. My prayer is that through that ministry and everything else I do the great glory of our God and Savior Jesus Christ would be magnified as more and more people come to live out the obedience of faith more and more deeply." John is the author of over 50 books and now frequently travels to speak, and writes regularly, through Desiring God. John and Noel have four sons, a daughter, and twelve grandchildren.